Dec. 6, 2018 | Most people are familiar with the medical condition pneumonia, but don’t understand its severity and the complications it can cause. Pneumonia is not a disease but rather an infection in one or both of the lungs. It causes the air sacs of the lungs to get irritated and swollen. They may fill up with fluid or pus. 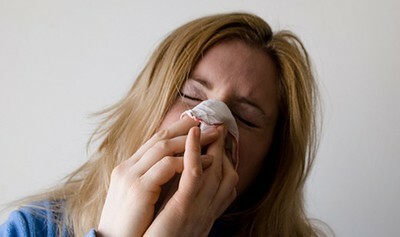 A variety of organisms, including bacteria, viruses and fungi, can cause pneumonia. The condition can range in seriousness from mild to life-threatening. It is most serious for infants and young children, people older than age 65, and people with health problems or weakened immune systems. Over half a million people in this country will visit an emergency room this year with pneumonia, with more than 40,000 cases proving fatal. You can help prevent pneumonia and other respiratory infections by following good hygiene practices. These practices include washing your hands regularly and disinfecting frequently touched surfaces. Dec. 6, 2018 | Most of the time, the body filters germs out of the air that we breathe. This keeps the lungs from becoming infected. But germs sometimes find a way to enter the lungs and cause infections like pneumonia. These are more likely to occur when your immune system is weakened or when your body fails to filter germs out of the air that you breathe. When the germs that cause pneumonia reach your lungs, the lungs’ air sacs become inflamed and fill up with fluid and pus. This causes the symptoms of pneumonia, such as a cough, fever, chills, and trouble breathing. When you have pneumonia, oxygen has trouble reaching your blood. If there is too little oxygen in your blood, your body cells can’t work properly. Because of this and infection spreading through the body, pneumonia can prove fatal. Pneumonia affects your lungs in two ways. Lobar pneumonia affects a section or lobe of a lung while bronchial pneumonia affects patches throughout both lungs. Dec. 6, 2018 | There are several different types of pneumonia. Bacterial pneumonia can occur on its own or develop after you’ve had a cold or the flu. The people at greatest risk for bacterial pneumonia include people recovering from surgery, people with respiratory diseases or viral infections and people who have weakened immune systems. Viral pneumonia caused by the influenza virus may be severe and sometimes fatal. The virus invades the lungs and multiplies; however, there are almost no physical signs of lung tissue becoming filled with fluid. This pneumonia is most serious in people who have pre-existing heart or lung disease and pregnant women. Mycoplasms are the smallest free-living agents of disease in humankind. They are not classified as to whether they are bacteria or viruses, but they have traits of both. Mycoplasms cause a mild and widespread pneumonia. They affect all age groups, but occur most often in older children and young adults. Dec. 6, 2018 | The symptoms of pneumonia can vary greatly, depending on any underlying conditions the patient may have and the type of organism causing the infection. Pneumonia often mimics the flu, beginning with a cough and a fever, so the patient may not realize they have a more serious condition. Some common signs of pneumonia may include fever, cough, and shortness of breath, sweating, chest pain, headache and fatigue. Ironically, people in high-risk groups such as older adults and people with chronic illnesses or weakened immune systems may have fewer or milder symptoms than less vulnerable people do. And instead of having the high fever that often characterizes pneumonia, older adults may even have a lower than normal temperature. Because pneumonia can be life-threatening, see your doctor as soon as possible if you have a persistent cough, shortness of breath, chest pain, unexplained fever or if you suddenly feel worse after a cold or the flu. Dec. 6, 2018 | When it comes to treating pneumonia, the method of treatment depends on the severity of the symptoms and the type of pneumonia the patient has. Bacterial pneumonia is usually treated with antibiotics. Although you may start to feel better shortly after beginning your medication, be sure to complete the entire course of antibiotics. Stopping medication too soon may cause your pneumonia to return. It also helps create strains of bacteria that are resistant to antibiotics. Antibiotics aren’t effective against most viral forms of pneumonia. And although a few viral pneumonias may be treated with antiviral medications, the recommended treatment generally is rest and plenty of fluids. Mycoplasma pneumonias are treated with antibiotics but even then recovery may not be immediate. In some cases fatigue may continue long after the infection has cleared. And if your pneumonia is caused by a fungus, you’ll likely be treated with antifungal medication.